This line of research is focused on the cellular mechanisms of disease, mainly on the regulation of neural stem cells (NSC), neurogenesis and the neural stem cell niche. We are interested in the paracrine regulation of NSC behavior and, specifically, in vascular trophic factors, such as betacellulin, that can induce NSC proliferation and neurogenesis. We are using these scientific advances to explore new therapies for the treatment of stroke, which is a leading cause of death and disability worldwide. We have established the surgical MCAo model (middle cerebral artery occlusion) in rat and mouse, which mimics the human ischemic stroke. The complete repertoire of non-invasive imaging techniques available in our lab, such as MRI and PET, enables the study of the effect of different treatments including drugs, cells or growth factors on the damaged brain in vivo. We have set up and optimized in our lab new technologies for 3D visualization of specific proteins in tissues. Tissue clearing techniques combined with light sheet microscopy enables 3D imaging of different organs and tissues. CUBIC (Clear, Unobstructed Brain/Body Imaging Cocktails and Computational analysis) is a novel technique to make organs and tissues transparent. We have set this technology up in our lab and it is now being applied to different organs (brain, heart, lung, intestine, etc.) from different animal species (mouse, chicken embryo, fly). Human samples have been cleared in our lab and stained with this technology to obtain a 3D imagine that is impossible to get with standard technology. 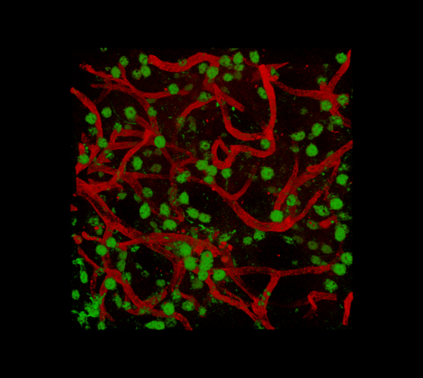 This method is compatible with immunohistochemistry and endogenous proteins in whole organs and large pieces of tissue. With this technology we can visualize neurons in a whole brain, neuronal processes and connections, heart microvasculture and other cell types and we can carry out morphometric studies. -MARÍA VICTORIA GÓMEZ-GAVIRO #, Evan Balaban, Diana Bocancea, María Teresa Lorrio, María Pompeiano, Manuel Desco, Jorge Ripoll, and Juan José Vaquero. #Corresponding author. 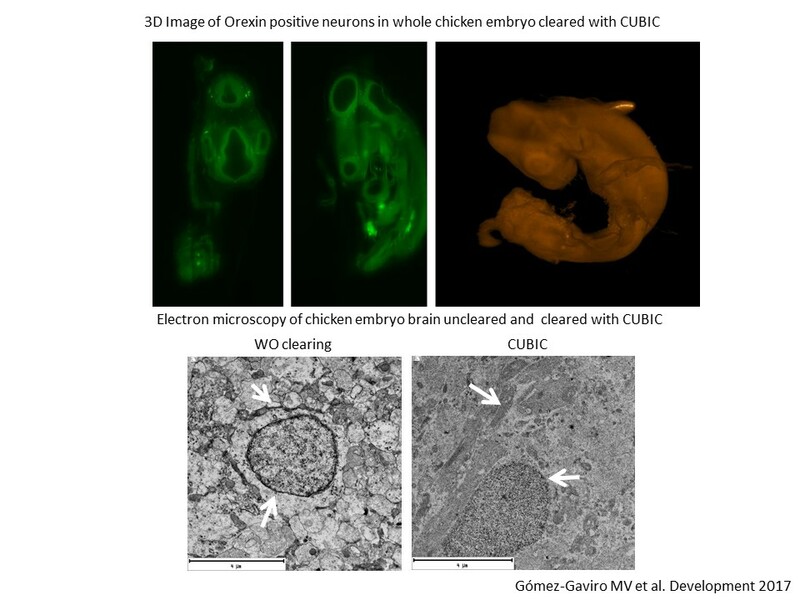 “Optimized CUBIC protocol for 3D imaging of chicken embryos at single-cell resolution. Development. 2017 Apr 21. pii: dev.145805. doi: 10.1242/dev.145805. Michele Cioffi, Sara M. Trabulo, Mireia Vallespinos-Serrano, Jaimy Saif, Ultan P. Cronin, Manuel Perez, Joaquim Soriano, Deepak Raj, Manuel Desco, MARIA VICTORIA GOMEZ-GAVIRO, Lorena Cusso, Diego Megias, Alexandra Aicher*, Christopher Heeschen. The miR-25-93-106b cluster regulates SDF-1 and PD-L1 expression in response to tissue injury. Oncotarget. 2017, Mar 28;8(13):21609-21625. doi: 10.18632/oncotarget.15450. Lara-Pezzi E, Desco M, Gatto A, Gómez-Gaviro MV. Neurogenesis: Regulation by Alternative Splicing and Related Posttranscriptional Processes. Neuroscientist. 2016 Nov 10. pii: 1073858416678604. I Nehrhoff, D Bocancea, J Vaquero, JJ Vaquero, MT Lorrio, J Ripoll, M Desco and MV GÓMEZ-GAVIRO. 3D confocal imaging in CUBIC-cleared mouse heart. Libro de Actas XXXIV CASEIB 2016, pag (118-121). B. Zufiria D.I. Bocancea, M.V. Gómez-Gaviro, J.J. Vaquero, M. Desco, M. Fresno, J. Ripoll and A. Arranz. 3D imaging of the cleared intact murine colon with light sheet microscopy. Proc. of SPIE Vol. 9713 97130Q-2, 2016. D. Bocancea, M.V.Gómez-Gaviro, E.Balaban, M.Desco, J. Ripoll, J.J. Vaquero. 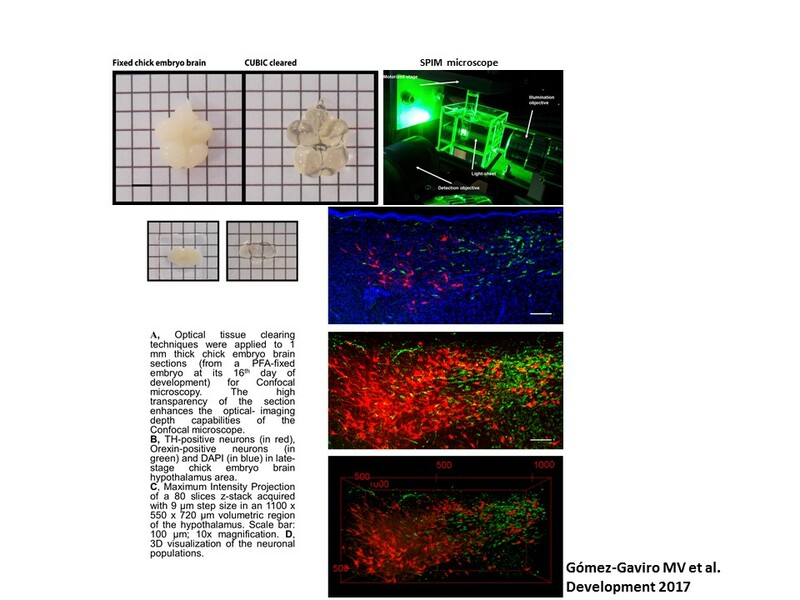 High Resolution 3D Microscopy of Developmental Neurogenesis in Chick Embryo Models. XXXIII CASEIB, LIBRO DE ACTAS 495-8. Nov. 2015. I Cuadrado*, MV Gómez-Gaviro*, Javier Bermejo, Yolanda Benito, Manuel Desco, Francisco Fernández-Avilés, María Fernández (IIBM), L Boscá1 and B de las Heras. A labdane diterpene exerts ex vivo and in vivo cardioprotection against post-ischemic injury: Involvement of AKT-dependent mechanisms. Biochem Pharmacol. 2014 Dec 31. pii: S0006-2952(14)00725-4. MV Gómez-Gaviro, PL Sánchez, Lovell-Badge, R. and Fernández-Avilés, F. Looking for the niche: substance delivery into the lateral ventricle of the brain: implantation of the osmotic minipump system : Chapter in Methods and Protocols; Methods in Molecular Biology Springer's protocols. Methods Mol Biol. 2013;1035:135-40. MV Gómez-Gaviro, Lovell-Badge, R., Fernández-Avilés, F., and Lara-Pezzi, E. The vascular stem cell niche. J. Cardiovasc. Transl. Res. 2012 Oct;5(5):618-30. MV Gómez-Gaviro, Scott C, A. Sessay, S. Booth, A., Matheu. and Lovell-Badge R. Betacellulin induces proliferación in the neural stem cell niche and induces neurogenesis. Jan Proc. Natl. Acad. Sci. USA. 2012. 109(4):1317-22. Charlotte E. Scott, et al, MV Gómez-Gaviro, Bo Gao, Kathrin S.E. Chea, Lovell-Badge R, Briscoe J. Sox9 induces and manteins neural stem cells. Nat. Neurosci. 2010. 13(10):1181-9. GOMEZ-GAVIRO MV*, Domínguez-Luis MJ*, Canchado J, Calafat J, Janssen H, Lara-Pezzi E, Fourie A, Tugores A, Mollinedo F, Sánchez-Madrid F, and Díaz-González F. Expression and regulation of the metalloproteinase Adam-8 during human neutrophil pathophysiological activation and its catalytic activity on l-selectin shedding. J. Immunol. 2007 Jun 15;178(12):8053-63. *Equal contribution. 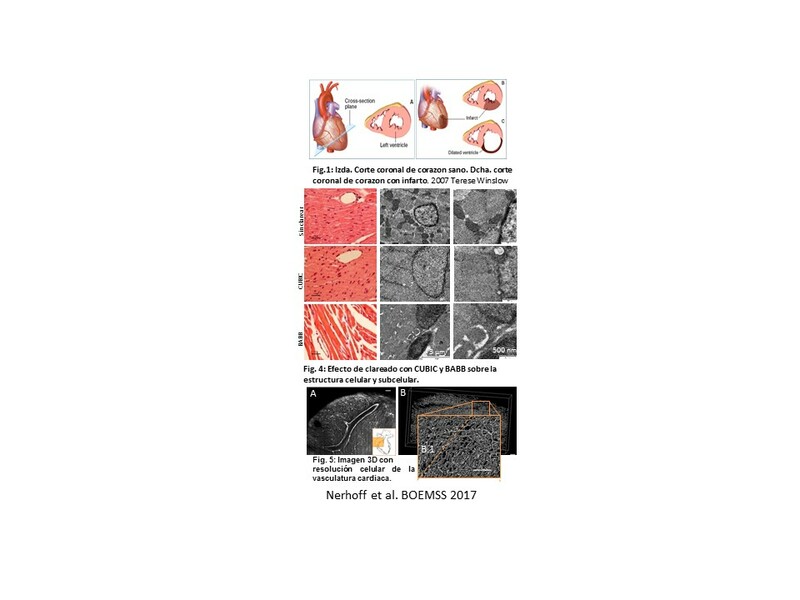 - García de Vicuña R*, GOMEZ-GAVIRO MV*, et al, and Díaz-González F. CC and chemokine receptors mediate migration, proliferation and metalloproteinase production in fibroblast-like synoviocytes from rheumatoid arthritis. Arthritis Rheum. 2004 Dec. 50(12):3866-77. *Equal contribution. - GOMEZ-GAVIRO MV*, Gonzalez-Alvaro I*, Dominguez-Jimenez C, Peschon J, Black RA, Sanchez-Madrid F, Diaz-Gonzalez F. Structure-function relationship and role of tumor necrosis factor-alpha-converting enzyme in the down-regulation of L-selectin by non-steroidal anti-inflammatory drugs. J. Biol. Chem. 2002.Oct. 277(41):38212-38221. *Equal contribution. - Lara-Pezzi E, GOMEZ-GAVIRO MV, Gálvez BG, Mira E, Iñiguez MA, Fresno M, Martinez-A C, Arroyo AG, Lopez-Cabrera M. The hepatitis B virus X protein promotes tumor cell invasion by inducing membrane-type matrix metalloproteinase-1 and cyclooxygenase-2 expression. J Clin Invest. 2002.110(12):1831-1838. - GOMEZ-GAVIRO MV, et al, Sánchez-Madrid F, Diaz-Gonzalez F. Down-regulation of L-selectin expression in neutrophils by nonsteroidal anti-inflammatory drugs: role of intracellular ATP concentration. Blood, 2000. 96:3592-3600. Brade, I+D Tecnologías P2013/ICE 2958. Marie Curie Intraeuropean Fellowship. 7th FP, EU. 2011-2013. 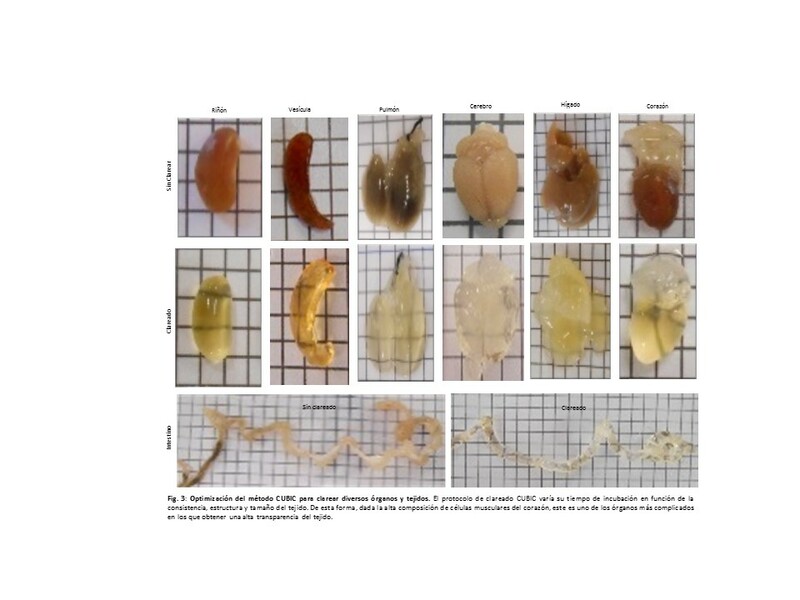 "Regulación de las células madre mesenquimales por la vasculature y potenciación de su capacidad regenerativa en el tratamiento del infarto de miocardio”; Score 97/100. Grant ref. 275885. Marie Curie Intraeuropean Fellowship. 6th FP, EU. 2006-2008. 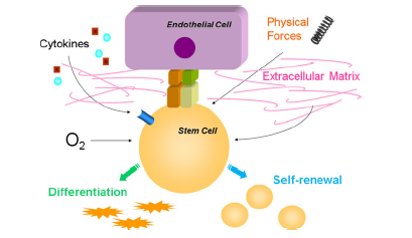 "Role of the vasculature in the neural stem cell niche". Score 87,5/100. Project Nº 024714.